Welcome to WEEK 12 of our #XFILESQUILT Event. This is it! You now have every pattern you need to finish the #XFILESQUILT as designed. 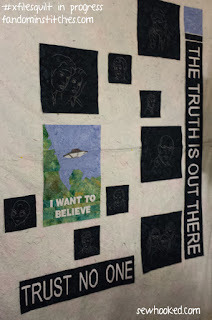 I Want To Believe: An X-Files Quilt & Stitch Along is designed and presented by me, Jennifer Ofenstein (also find me on sewhooked.com). my best friend and pattern tester for this event. Check out her blog here and leave her some love! And now... THE FINAL BLOCK! This was, without a doubt, my favorite part of this project to design and piece. It was the first piece of this quilty puzzle and started the entire idea! Just don't throw pencils at it, okay? Optional: add additional borders for a larger quilt. Well, my friends, here we are! 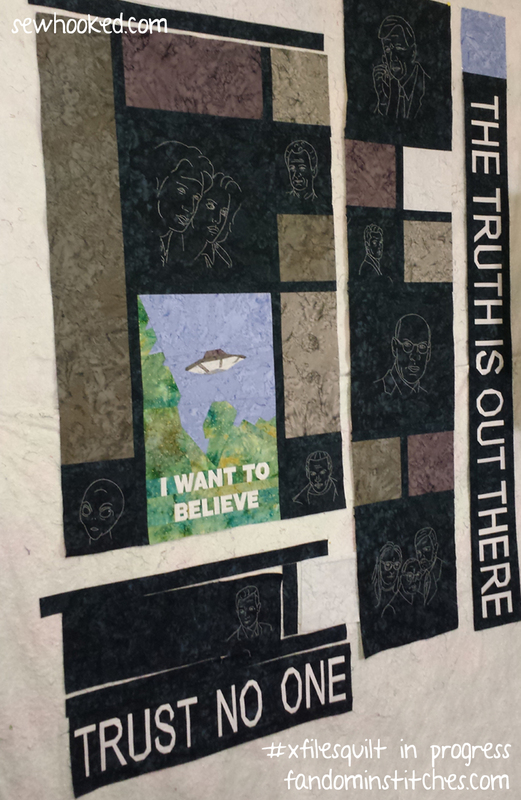 This is the completed X-Files quilt top, with our 9 embroidered and 3 paper pieced blocks. As you can see, there is room for the Bonus blocks, if desired. Everything you need to know to finish this project is here. If you have a design wall or blank space to arrange your top, this is the time to use it! The layout looks complex, but if you take it one section at a time, you'll find it comes together in no time. In progress... follow the chart, take your time and you'll be fine! Want a more designs for your quilt? so get yours in soon! Details are here. 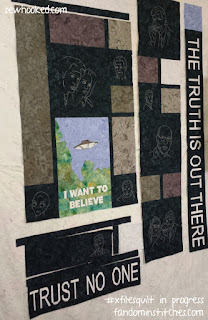 REMINDER: If you are participating in I Want To Believe: An X-Files Quilt & Stitch Along, then you are cordially invited to make a Signature Block for this very special quilt. It is not required, but it is much appreciated! ♥ Patterns are due December 1, 2016. More details in the above pattern document. 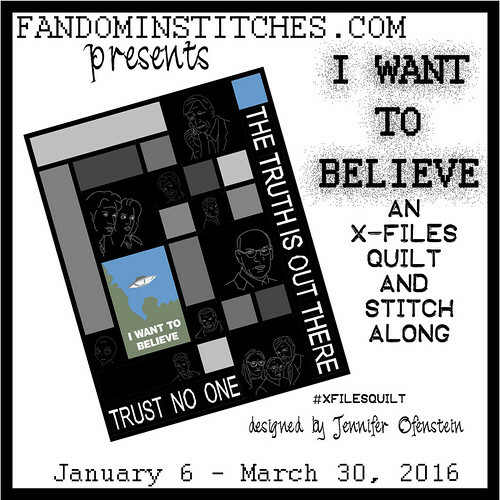 I Want To Believe: An X-Files Quilt & Stitch Along (#xfilesquilt), is a free event hosted on fandominstitches.com. It was conceived of and designed by Jennifer Ofenstein of sewhooked.com & fandominstitches.com. The event runs through March 30, 3016. 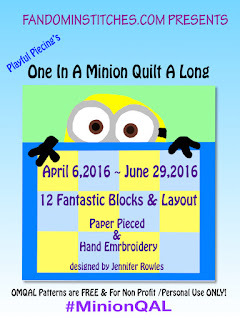 This event includes 12 free patterns plus additional bonus blocks to use as you wish as well as piecing instructions for the quilt top. Patterns are a combination of hand embroidered and paper pieced. The pattern sizes for each block correspond with the layout shown. Feel free to use colors that work best for you. The final quilt size as designed is 50” x 64”. These patterns are free for your personal and NON-profit use only. Not to be used for manufacture or distribution. Sale of this pattern or quilts made from this pattern is prohibited. No infringement of any kind is intended. For best results with paper pieced patterns, print with NO SCALING. In Google Drive, uncheck “fit to page..” See your printer instructions for more details if needed. One-inch scale included on every page for your convenience. Fabric amounts are generous estimates and are provided as a courtesy. Actual amounts may vary depending on your paper piecing technique. (MORE DETAILS IN PRINTABLE DOCUMENT). 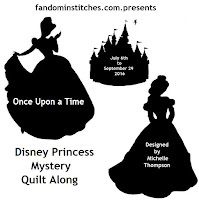 Need paper piecing or embroidery help? Click here. Visit sewhooked.com for more paper piecing help. Community support can be found in The X-Files Quilt & Stitch Along Facebook Group. Posting on social media? Mark you photos #xfilesquilt!